A cigar is a great way to enjoy some fine tobacco and to kill an hour or so. 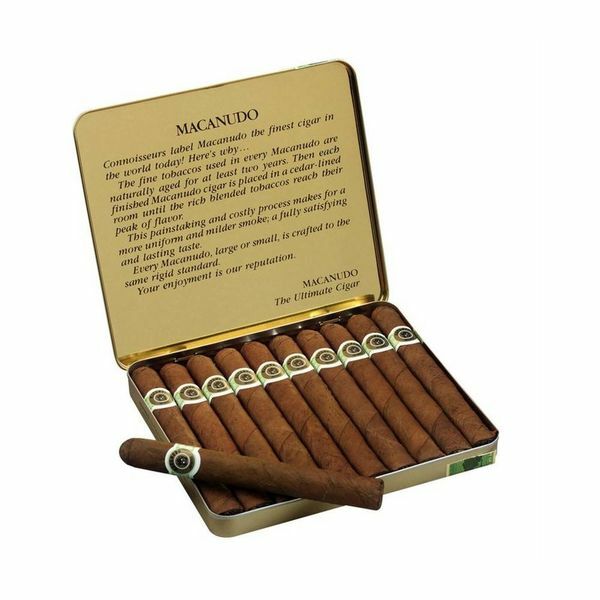 But what if you’re somewhere where you would like to enjoy, say, a nice Macanudo cigar, but you don’t have that hour or so to do so? There are a few solutions possible here. The first is that you puff that cigar as fast as you possibly can; the usual stance on smoking a cigar is a puff a minute or so to make sure that it stays lit and that you’re not smoking too fast, and puffing too quickly can make you feel ill for a variety of reasons. The next option is to smoke whatever you can, and then let the cigar go out, to relight it later. The downside here is that the cigar’s flavor is going to be marred by the once-burnt tobacco being relit. You can always just smoke a few puffs and then throw the rest out, but if that cigar is a nice one, this seems almost sinfully wasteful. The Macanudo Ascots provide our final answer. Instead of trying to smoke a full-sized cigar, the Ascots are a tiny little Macanudo that comes in packs of ten, a mild cigarillo that can be enjoyed in minutes at most. It’s got a smooth flavor to it, and they are available in the Café and Maduro flavors, allowing you to choose how strong of a smoke you want. A truly enjoyable cigar that you should pick up in its fashionable tin if you’re pressed for time.